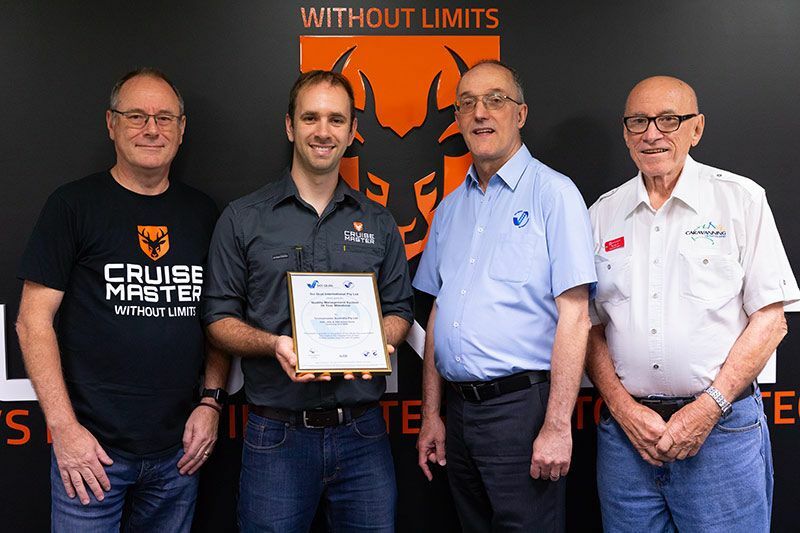 Cruisemaster, the company behind the highly regarded Cruisemaster suspension systems and Hitchmaster couplings, has received independent recognition for “consistently achieving high standards in its business operations”. The long-time Caravanning Queensland member has been recognised for 20 years of continuous certification to ISO9001:2015, an international standard for quality management often required for government and automotive-level supply. From left: Cruisemaster managing director Chris Goddard, technical operations director Andrew Goddard, Sciqual general manager Ben White, and Caravanning Queensland CEO Ron Chapman. Cruisemaster technical operations director Andrew Goddard said the award was a significant achievement that “recognises our team’s drive to be the best in the industry”. “This certification is a testament to our strong focus on quality as it shows we have the process and capability in place to ensure we are delivering the best for our customers,” he said. The certification is conducted annually by independent organisations over several days to assess systems and processes in comparison to the international standard. Achieving the certification is considered a benchmark for measuring the maturity of an organisation’s quality management system and the 20 years award for Cruisemaster is an industry first for the state. Caravanning Queensland CEO, Ron Chapman, said the 20-year certification was a significant award and that we was honoured to have been part of the presentation. “Having spent 50 years in the industry, I know what it takes to achieve such an award,” said Mr Chapman. “While the industry has changed a lot, consumers’ demand for good quality products and great customer service from Australian manufacturers hasn’t. Cruisemaster was awarded the 20-year certificate on September 27 by Ben White, general manager of Sciqual, an auditing company that has been assessing Cruisemaster for 20 years.